An NHS winter that never seems to end? Home / An NHS winter that never seems to end? No one would ever claim that winter in the NHS is easy. Our most recent Quarterly Monitoring Report (QMR) duly paints a picture of accident and emergency (A&E) departments that are struggling to cope as the health needs of patients become both more complex and more acute. The recent publication of the latest set of daily performance reports for the traditionally busy winter months of 2016/17 now allows us to take a closer look at how the NHS held up this winter. Although there has been considerable discussion of new potential approaches to measuring A&E performance, the standard remains for 95 per cent of patients to be discharged, admitted or transferred within four hours of arrival in A&E. 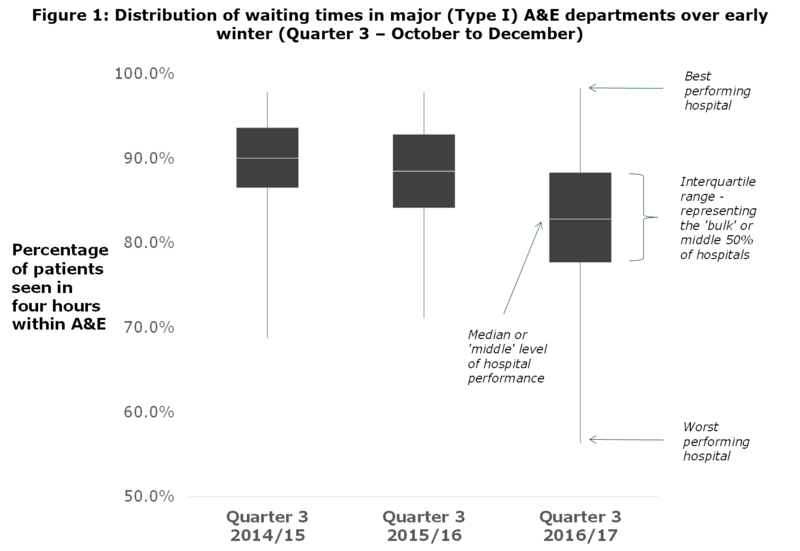 However, when we look at the distribution of A&E waiting times across major (or ‘Type I’) A&E departments over the early winter months, it is clear that the ‘bulk’ of hospital performance has moved sharply downwards. Nationally, from October to December 2016/17 only 81.9 per cent of patients were seen within four hours, compared to 87.4 per cent just one year earlier (Figure 1). Perhaps even more worryingly, Figure 1 shows how much more variable the range of performance is this year across different hospitals. Over the previous two years only one hospital saw less than 70 per cent of patients within four hours; in 2016/17 more than ten hospitals were performing at this level – with the lowest performing hospital seeing only 56.3 per cent of patients within four hours. The improvements in A&E performance over the past decade were incredibly hard-won: investments in A&E staffing levels, increases in the physical capacity of A&E departments and improvement in how services were planned and designed to ensure the safe and effective flow of patients through the hospital. We are now in danger of losing these benefits more quickly and deeply than was previously feared. So why has performance deteriorated so rapidly and what made this year so much worse? There has been a noticeable absence of the usual suspects that cause ‘winter pressures’. The incidence of winter vomiting bugs like norovirus – which can rapidly close entire wards and reduce the number of beds available for patients awaiting admission from A&E – is lower than in previous years. And the relatively dry and mild weather has limited the demands made by respiratory conditions such as influenza-like illness. This all suggests there is a deeper challenge now facing A&E departments. I recently spoke to a hospital chief operating officer whose A&E department was built to see 60,000 patients each year and is now routinely seeing more than 100,000 patients. For departments like his, the recent emphasis on redirecting A&E patients with minor medical conditions to primary care may help to relieve some pressure. But as finance directors in our QMR survey point out, the lack of available hospital beds (due to a potent mix of rising demand from sicker and more complex patients, social care cuts, flat-lining hospital budgets and increasing delays in transferring patients out of hospital) seems to be the primary cause of long waits in A&E. Research dating back to the National Beds Inquiry 15 years ago, and even further back to Erlang’s work on queuing theory, indicates that when more than 85 per cent of beds are occupied, hospitals will encounter problems in handling emergency admissions. Figure 3 (below) shows that the NHS had less than 85 per cent occupancy on just three days – and unsurprisingly these included the atypical days of Christmas Eve and Christmas Day. In previous years, bed occupancy levels have traditionally eased as we enter the spring and summer months. But that may not be the case this year as hospitals try to make up for lost ground by rescheduling the many surgical operations that were cancelled due to pressures over winter. So if the problems in A&E performance are both structural and system-wide across health and social care, where does this leave us? First, although there is much to learn from how trusts like Luton and Dunstable University Hospital have redesigned A&E services to maintain low waiting times, the solutions to A&E pressures are now unlikely to be solely within the gift of individual hospitals. Future proposals to support struggling A&E departments may need to follow the whole-system ethos of the success regime and sustainability and transformation plans, rather than the institutional focus of ‘special measures’. Second, there may be no quick fixes. If there is indeed more funding for social care in the upcoming Spring Budget it will provide much-needed short-term relief for pressured services. But in local areas where social care capacity has been stripped back and residential and care homes have already been closed and sold, it will take time for additional funding for social care to have an impact on performance in A&E – if at all. Finally, we need to recognise that we are not out of the winter woods yet. Over 70 per cent of finance directors in our recent QMR survey opened additional hospital beds and increased the number of clinical staff to cope over winter this year. 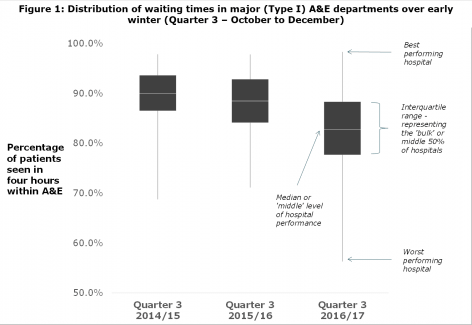 But if norovirus, flu and respiratory distress aren’t the causes of longer waits in A&E this winter, then we would be wrong to assume that A&E performance will bounce back as winter recedes. It may be the case that some of these ‘winter’ escalation beds stay open well into the summer months, and that A&E departments now must cope with a winter that never seems to end.